Uber has experienced explosive growth over the last three years: Since raising $US49.5 million in 2011, $US258 million in 2013, and a whopping $US1.2 billion in June, Uber has made its ridesharing service available in more than 200 cities in 45 countries worldwide. Now, the company is looking to close a new funding round that would value the company between $US35 billion and $US40 billion. We thought it’d be interesting to compare Uber’s sky-high valuation to that of Facebook, another massively popular tech company. Based on company data charted for us by BI Intelligence, Uber is considerably further ahead than Facebook was, at least in terms of its valuation, in its third year of fundraising. 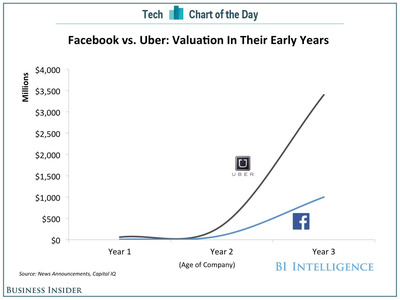 Facebook achieved Uber’s $US35-40 billion valuation during its seventh year, two years before its IPO in 2012.